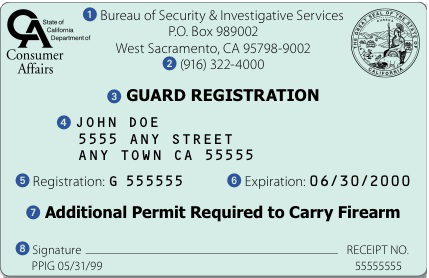 8-Hour Security Guard Card Training in Ontario CA - Triton Global Services. All Security Guard Classes provided by Triton Global Services are instructor-led courses. Our instructors are highly qualified and professional with over 20 years of law enforcement and military experience combined. Our Security Guard Training Center is located in the Inland Empire, CA. Our instructors have the skills and knowledge to ensure that every participant finishes the courses with a solid and complete understanding of the material. During the powers to arrest portion of the course individuals will learn what powers they have as a security professional and how to implement them. The weapons of mass destruction portion of the course includes how to identify possible terrorist activity, weapons commonly used in terrorist attacks, and what kind of locations may be possible targets as well as what to do in the event of a terrorist attack. Once the initial 8- hour guard card course has been completed, a final written exam is given to ensure the required skills needed to perform effectively as a security guard, have been met. The exam is a list of multiple choice questions. When you have completed the exam, our experienced guard instructors will go over the questions with you. A 100% score or higher is needed to pass. After completing the basic guard course individuals are required to complete an additional 32 hours of training to remain compliant 16 hours of which must be completed within 30 days. As a security professional your primary job is to be a visible deterrent, however, this often puts individuals directly in the public eye and subjects them to scrutiny. In our public relations course, individuals will learn how to handle constant pressure brought forth by everyday issues from the constant surveillance of the public. A security professional along with being a visible deterrent is there to observe and report. In our observation and documentation course individuals will learn how to properly document all activity in a security professionals area of responsibility. After a security professional properly observes and documents a particular incident he or she now needs to know how to communicate that information to other security members and supervision. Our communication course instructs individuals on how to clearly communicate with others to ensure that all issues and incidents can be properly addressed in a timely matter. Security professionals are subject to the laws just as all other everyday citizens are. Our liability course teaches security professionals how to avoid inadvertently breaking the law and getting into legal trouble.